What draws guests here is the hotel’s location and business-traveler focus. From the chic glass-and-white-tile exterior and sweeping two-level lobby to the rooms, the hotel offers a contemporary but comfortable look. Expect modernized baths with extra counter space, updated closets and safes, and an upgraded room key security system. YOU SHOULD KNOW As with other high-end properties, wifi isn't free. Join the SPG program (for free) in advance of your stay for free standard internet access when you book through Starwood websites, mobile websites, and mobile apps. Traditional rooms are decorated in earth tones with contemporary furniture, multifunctional workspaces, natural light, the Westin Heavenly Bed and coffee makers with Starbucks coffee. There are 365 rooms, including 11 suites. For about $30 more a night, a stay in the Westin Executive Club room includes access to the private lounge on the 21st and 22nd floors. There are perks like daily complimentary continental breakfast, panoramic views, complimentary Internet access and afternoon snacks and evening hors d'oeuvres. Bathrooms have large, backlit mirrors, Heavenly Rainforest shower heads and tub combos, and offer White Tea Aloe by Westin bath products. The dual-level lobby is spacious and bright, with the entire front wall dedicated to floor-to-ceiling windows. There's plenty of mid-century modern, yet comfortable seating just in front of the large check in area. The hotel restaurant, The Palm, sits just off the lobby. There's an indoor, heated lap pool perfect for a bit of exercising or just taking an refreshing dip. Hotel guests can also take advantage of the onsite steam room and sauna. The WestinWORKOUT Fitness Studio is spacious and offers all the trendiest workout equipment available right now, including kettlebells, medicine balls, strength bands, and the signature TRX suspension system. If you're more of a traditionalist, there are plenty of treadmills, stationary bikes, step benches, free weights and elliptical machines. Runners will enjoy the three- and five-mile RunWESTIN running routes around Buckhead, designed in partnership with New Balance. The partnership also offers a gear lending program to provide apparel, shoes and socks (that are yours to keep), right to your guest room for just $5. Offering breakfast, lunch and dinner, The Palm serves up classic steak and seafood entrees for a more formal dinner option. The menu is essentially refined American steakhouse so you're sure to find dishes the whole family will love. In-room dining is also available 24 hours a day, and make sure to check out the hotel's signature SuperFoodsRx menu packed with nutritional dishes that are in line with the Westin's wellness esthetic. Stop by the lobby between 5 pm and 7 pm for UNWIND, where lobby is transformed into a relaxing gathering spot for cocktails with soothing lights and soft music. The Palm Restaurant also offers an extensive wine list. While the Buckhead neighborhood is chic and great for shopping, it isn't close to many of Atlanta's most storied attractions. A complimentary car shuttle is available within a 2-mile radius of the hotel and guests are served on a first come, first serve basis from 7:00AM to 11:00PM. Otherwise, the MARTA Buckhead station is a 4-minute walk from the hotel, providing easy access to Midtown, downtown and the airport. 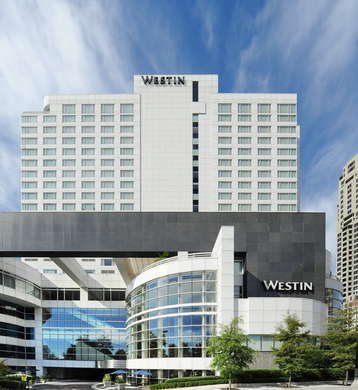 If you choose to deal with a car (and the traffic) Westin Buckhead overnight valet parking is $39 per night and self-parking costs $29 for overnight. It's a 3-minute walk to True Food Kitchen, a casual and health-conscious restaurant that features a wide variety of gluten-free, naturally organic, vegetarian and vegan offerings as well as fresh juices, seafood dishes and pizza. Another 3-minute walk brings you to Seven Lamps for seasonal and flavorful American cuisine like handmade pastas and wood grilled meats. All of the upscale bars in the area are located within area hotels. Southern Art Bourbon Bar within the InterContinental Buckhead Atlanta offers a selection of more than 70 bourbons (6-minute walk). Whiskey Blue lounge atop the W Hotel Buckhead serves crafted cocktail with beautiful views of downtown Atlanta (5-minute walk). All of the wellness features within the Westin Buckhead make it a standout property amongst the wide variety of hotel options in Buckhead. For those that are truly health conscious while traveling for business or vacationing, every way to take care of your well-being is covered, from dining options, fitness, aromatherapy, and even a sleep well menu of dishes designed to help you get the best rest possible. The only amenity missing is a spa but with all these wellness services, you can turn your room into a spa on its own.